I'm at an age now where I'm regularly surprised by the date and say things like, "where's the time gone?" and "hasn't the month just flown past?" 1st April 2014 was no different as March - far too quickly for my liking - whizzed by in a blink-and-its-gone fashion. The past four weeks have been more eventful than usual for me due to various appointments in addition to a trip to my university city, meaning I've actually left the house on a few occasions (bliss) and have therefore been able to satisfy all of my product junkie needs. Being a cosmetics fanatic who's mostly housebound, getting the rare opportunity to wear makeup again is one that I grab with both hands. I picked up one of the new Revlon ColourBurst Lacquer Balms (7.99) for free - kind of - in the irresistible Boots 3 for 2 offer, which I'm super glad about as it's fast becoming one of my most loved colours after only two wears - some sort of record, surely. Cherry reds are my favourite shade if I'm going for a statement lip, and 'Provocateur' is glossy cerise perfection. (P.S. can we also just address how darling Emma Stone looks in the promos - what a babe). In the same deal, I purchased an item that I've had my eye on for quite some time - the Real Techniques stippling brush (11.99). I'm strangely excited to have finally added a pink-handled brush into my gold and white collection, and now I can't wait to complete the little quartet with a purple one. If you're a beauty lover too, you'll understand that the thirst is real. An absolute dream for applying pigmented blush or bronzer and cream products, I've been reaching for it whenever I've needed some perking up in the complexion department, which - hi, fatigue related chronic illness - is every day. Whilst we're on the topic, let's talk about the products that've been gracing my cheeks for the past four weeks: 1) the discontinued (why oh why?) MAC Sheertone Blush in 'Pink Swoon' (£18) - my go-to everyday blush for its bright but light petal pop of colour, and 2) Laura Mercier Second Skin Cheek Colour in 'Lush Nectarine' (£20.50) - a beautiful shade that I was first introduced to by Anna from Vivianna Does Makeup who used to talk about this constantly back in the day, and with good reason. One pink and matte, one peach and sheeny. Spring cheeks = done. Apologies for the stock photos - I'll get a camera soon! Moving swiftly onto skincare, the Origins Make A Difference Plus+ rejuvenating moisturiser (£34) has been a stand-out item for me in March as I've used it twice a day every day, and have no complaints. 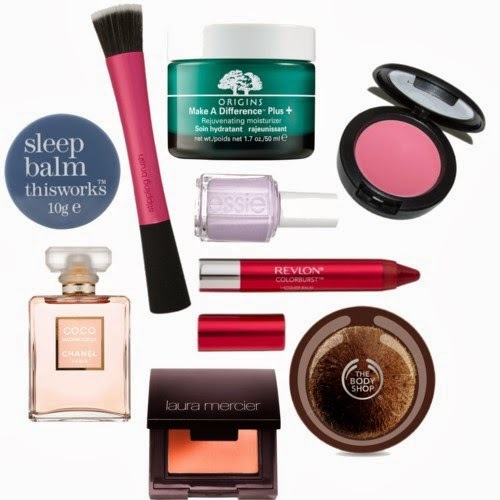 I'm out of night cream at the moment (and on the hunt for a new pot - I've got my eyes on the thisworks No Wrinkles Midnight Moisture (£46), but recommendations are welcome) and all of my skincare hopes, ergo, have been pinned onto this gem of a cream to perform in both my morning and evening routines. To its credit, it has well and truly stepped up to the plate - it needs two drops of Pai's Rosehip Bioregenerate Oil (£20) to bump up the moisture levels in the PM, but for the AM it's perfect by itself and I for one am impressed. As for my body, I've needed to pull out the big guns to combat my lacklustre limbs - enter The Body Shop and a product that every female I know has knocking around in their bathroom: their coconut body butter (£13). I feel like I've had a tub of this stuff in various scents since the age of about thirteen, anyone else? Smells heavenly, and well, it just works. A true essential that I'll never be without. My sleep, as per usual, was pretty terrible this month and I didn't spend nearly enough time in the land of nod. However, the few hours that I did get were aided by the thisworks Sleep Balm (£12) - a natural little number that packs a lavender punch. An absolute dream to work into pulse points, I feel the scent sends a much-needed "it's time to sleep" memo to my poor foggy brain and allows me to wind down in peace. My insomnia hasn't been cured - wishful thinking - but it certainly comes to my rescue in times of snooze-deprived need and is a nice addition to my deep breathing exercises. Venturing past my front door on a number of occasions in March meant that I was able to wear perfume again, and for me it has to be the one and only Chanel Coco Mademoiselle (£68). It won't make you disappear in a puff of sparkles à la Keira Knightley in the new advert, but it does smell pretty darn beautiful. You know when you've worn a perfume for so long that it becomes your signature scent and people say "it smells of you"? Coco's mine. All that I've been sporting on my nails has been Essie To Buy Or Not To Buy (£7.99), a shimmering light lavender that feels very Spring-appropriate. It falls into the 'bad Essie' camp, but with a steady hand and three coats it soon errs on the 'good Essie' side. It's a pretty, easy and wearable shade that I predict I'll wear the heck out of over the next few months. What products did you love in March? Ahh this is tempting the beauty addict in me too much!